My Pet Watch is the trusted, professional, affordable way to have your pets looked after while you’re away! Travelling soon and don’t know who to trust to care for your pets? Spend your holidays relaxing while we keep your pets tail wagging! Our in home pets visits suit pets that are happy to remain in the comfort of their own home. Dog, cats, birds, rabbits, fish and chickens we look after all kinds of pets so you can enjoy a relaxing time away, all while knowing your pets are being cared for by trusted caring hands. Keep track of your pet from the palm of your hand. Have you ever worried when your pet’s next worming or vaccination is due?Or perhaps you want to know if your pet is getting the right amount of exercise for his or her size and age. 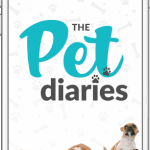 Maybe you just want to store your pets photos and key contacts in one location.The Pet Diaries does all of that and more. Designed and developed by pet owners, The Pet Diaries offers peace of mind to users.And it’s FREE!